Known as the “Mozart of Chess”, Magnus Carlsen is in a league of his own. The reigning World Champion’s rating has skyrocketed past Kasparov’s previous record of 2851 to an unfathomably high 2882 (1st May 2014). With fierce determination and a palpable will to win, he has dazzled fans with his ability to out-work his opponents and find computer-like moves in his games time after time. His superb endgame skill also allows him to squeeze the slightest of advantages and defeat opponents in positions that seem unwinnable. The sky's the limit for this young GM and he has the ability to stay in the clouds way above everyone else for a long time. Magnus Carlsen began his chess career at the age of 5. He originally learned the moves from his father but was actually uninterested in the game at that point. It was only at the age of 8 that he participated in his first tournament and ever since then his rise has been meteoric. He became an International Grandmaster at the age of 13, the youngest at the time. In October 2009 he became the 5th player to ever cross the 2800 rating barrier, and was the youngest player to do it by far. 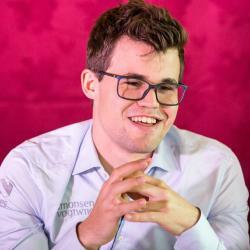 Ever since July 2011 Carlsen has been the highest rated chess player in the world. January 2013 brought about a new milestone in his illustrious playing career. This was when Carlsen broke Garry Kasparov’s rating record of 2851 by 10 points. Now he holds the current rating record of 2882, more than 65 points higher than the next best player. In November 2013 Carlsen defeated Viswanathan Anand to become the current World Champion, a title he does not plan on giving up anytime in the near future.